Football fans gather on the Benjamin Franklin Parkway near Eakins Oval before the start of the 2017 NFL draft in Philadelphia, Thursday, April 27, 2017. 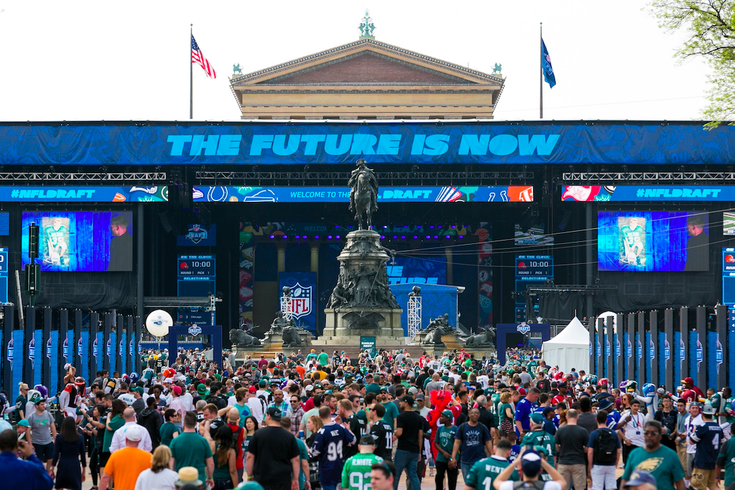 Everyone seemed to think Philly did a hell of a job hosting the 2017 NFL draft. Apparently, that wasn't enough to keep it here for a second year. Ian Rapoport reported Wednesday that Dallas, home of the rival Cowboys, would host the 2018 draft at AT&T Stadium. Commissioner Roger Goodell announced Wednesday that the Dallas Cowboys will host the 2018 NFL Draft at AT&T Stadium in Arlington, Texas -- the first time the event will take place inside an NFL stadium. The draft will run April 26-28. "Philadelphia raised the bar by taking the Draft to another level, and this new opportunity in Dallas will enable us to continue the event's evolution and grow it even further," Goodell said in a release. "We are grateful to the Dallas Cowboys, the cities of Arlington, Dallas, and Frisco, and the Dallas Sports Commission for their leadership in turning this vision into reality." With the 2018 iteration moving to Jerry World, expect an even bigger show to up the ante. After all, everything is bigger in Texas. Dallas had been reported to be the front-runner to host next year's draft. But the notion it would return to Philly started to gain steam after the national media dished out gushing praise and those who went set an attendance record. Ultimately, it feels like a bummer that it won't return, especially considering the draft's economic impact on Philly. For those who hated the traffic headaches? They're probably celebrating.